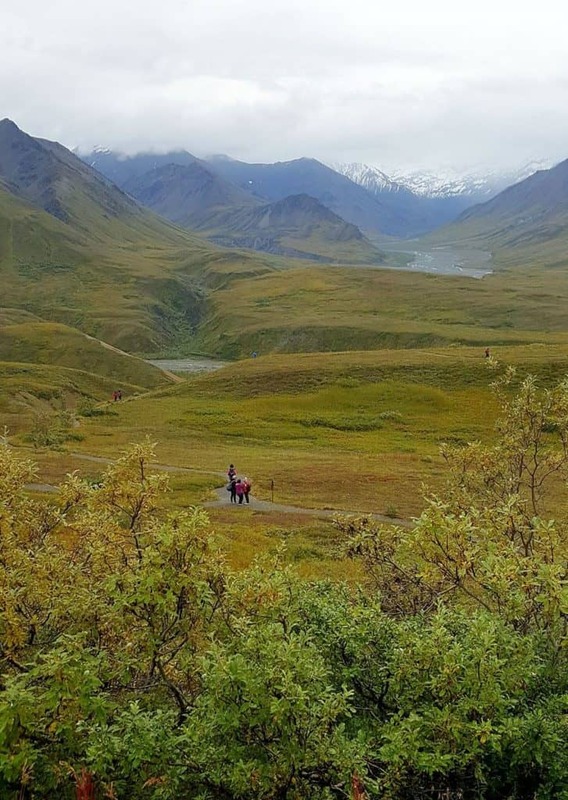 Visiting Denali National Park was undoubtedly one of the most amazing experiences of our Alaska road trip. As always – being the anxious traveler that I am – I had thoroughly researched visiting Denali before making making our reservations. I’m happy to say that it paid off. How well did the visit go? 19 Grizzly-bear well, that’s how well! How did we do it? 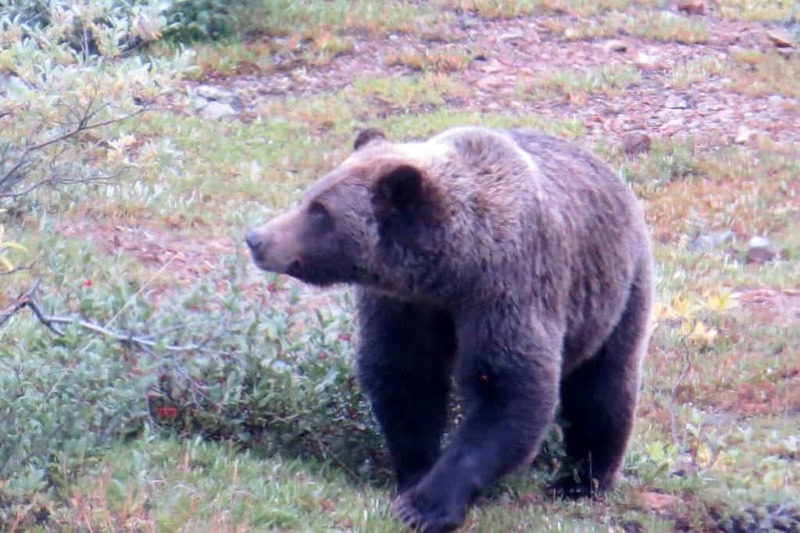 How did we manage to view so many bears – as well as a moose, several cariboo and a fox? 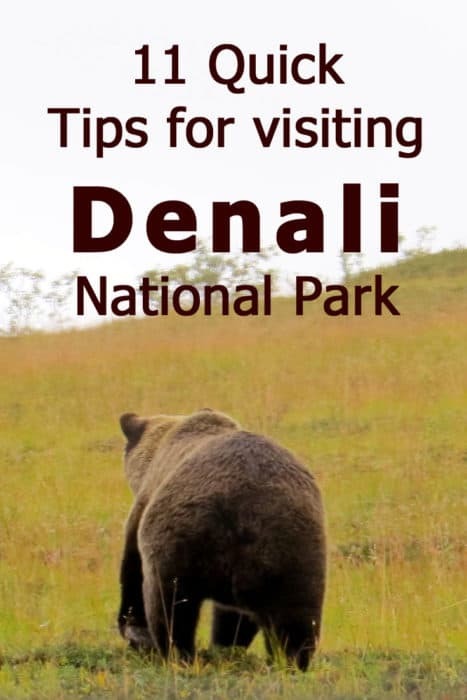 Let me share our Denali National Park tips with you and hopefully they’ll help make your visit a success too. First, a short(ish) illustrated report of our visit to Denali National Park in August 2017. During our visit to Denali, we stayed in the Aurora Denali Lodge in Healy for two nights (expect a review post on our stay real soon!). We arrived from Fairbanks around noon time and went straight to the Wilderness Access Center to pick up our tickets for the shuttle drive (planned for the following morning). After picking up said tickets, we took the free shuttle bus to the park kennels. 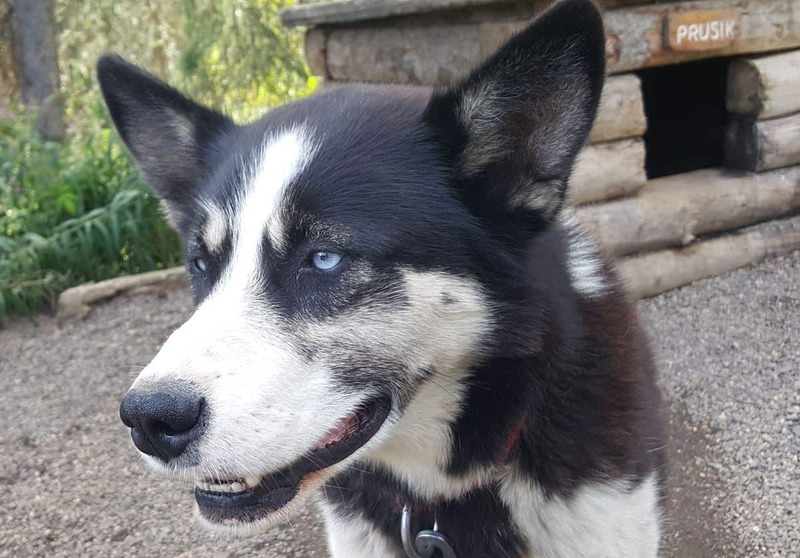 These are working kennels with genuine sled dogs. The rangers really do use sleds in the park during winter time. No motorized snow bikes. As they told us, when the temperatures drop to minus seventy, the dogs are far more reliable than carburetors. We spent half an hour walking among the beautiful huskies. I have never seen dogs less interested in human interaction. The word “aloof” doesn’t begin to describe how distant and impassive these dogs were. Beautiful, though. Then it was showtime. The rangers wheeled out the summer sled and the dogs went crazy. I have never seen any creature – human or animal – so enthusiastic about performing a job. They barked, yelped, jumped in the air and generally went out of their skins to be harnessed. We saw the dogs in action and heard a ranger talk about the kennels. Rather than wait for the next shuttle, we decided to hike back to the Visitors Center. We spent another hour in the Visitor Center before heading to the nearby town of Healy for the night. Woohoo! The big day has come! I had booked us the earliest possible shuttle out into the park. More on why we chose the shuttle and why so early, later on in the tips section. Our driver’s name was Chavez and he was pretty awesome! He also guides bus tours and gave us the same level of narration throughout the tour. 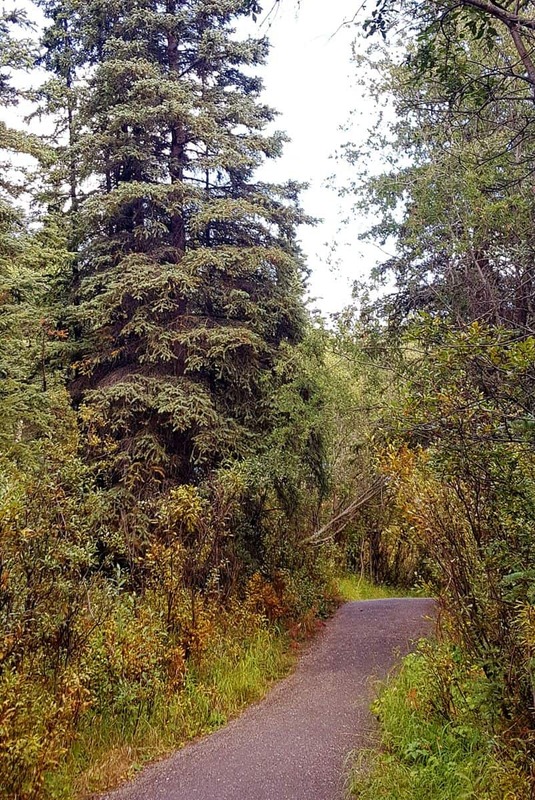 The first 15 miles of the way – the part that’s accessible to all vehicles – was on paved road. Once we reached the “shuttle-only” section we lost the paving and were going on a good quality dirt road. We then continued on the road for almost four hours to the Eielson Visitors Center and back. I have some experience with mountain driving and let me say here that there’s a good reason why they don’t allow private vehicles on this road. Most of the way it’s fine but there are pretty scary sections that are winding and narrow. Passable, yes, but it’s good to have an experienced driver at the wheel. Chavez told us that the park drivers go through rigorous training, including an annual refreshers course and testing. 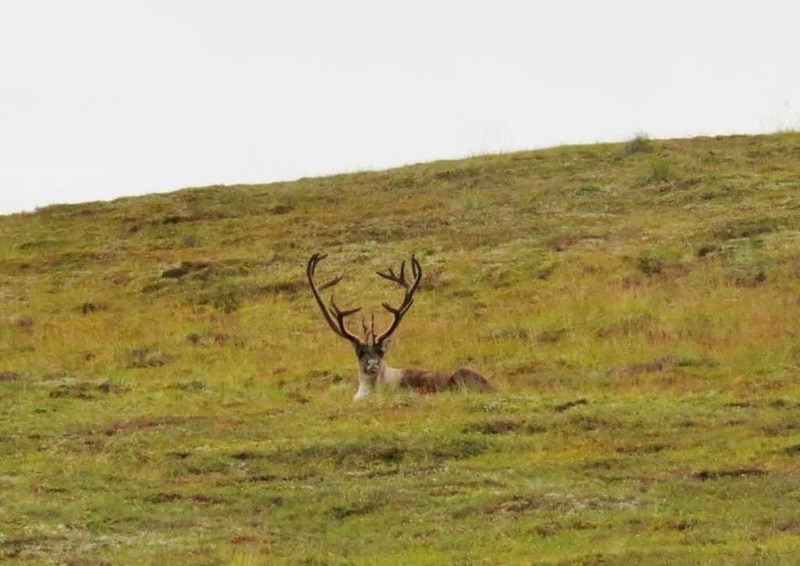 In Denali, always be on the lookout for wildlife! We didn’t see any on the paved section of the road but according to Chavez, that’s actually a good area for moose sightings. We could see heavy machinery by the side of the road so the noise from the construction may have driven the animals away. The next sighting was not at a distance at all. Another Mama bear with two cubs were getting very close to the bus! This is what looked like from inside the bus. Can you feel the excitement? 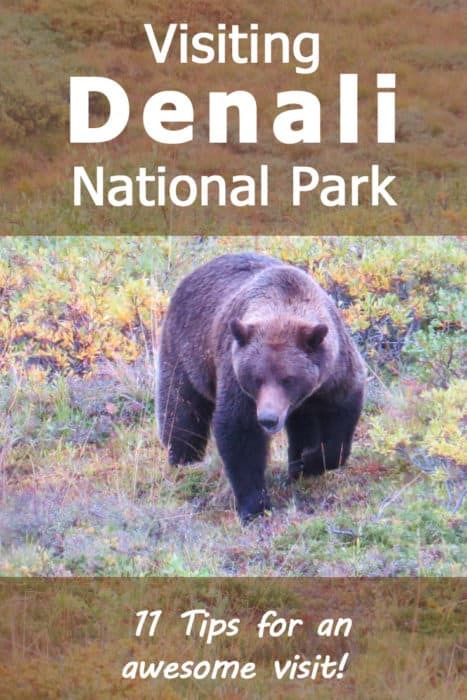 There are no black bear in Denali, only Grizzly bears. They’re considered the more dangerous of the two types and the ones more likely to view humans as prey. With so many of them in the park, it’s important that they know to keep their distance from visitors. Which is not always easy. Chavez told us that this sow and cubs were becoming problem bears. 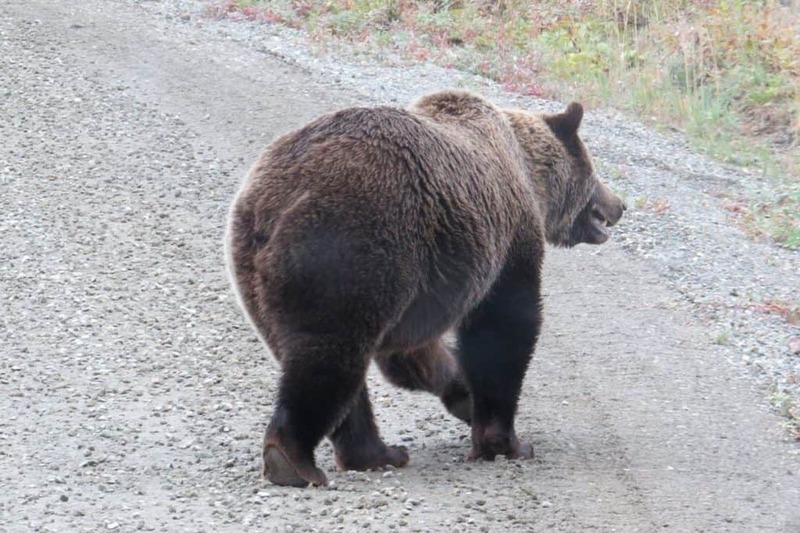 Once bears lose their fear of humans, they will also attempt to approach pedestrians in order to get some food. And that’s very dangerous for the bears because they will be put down before they move on to attack anyone. So, Denali has teams of wildlife technicians – that’s actually a job, apparently! – who follow problem bears like these and try to scare them away by shooting rubber bullets at them. We actually saw the team sitting nearby and observing the interaction. Chavez told us that the previous week, this very sow and her cubs approached his bus and actually bit parts of it! 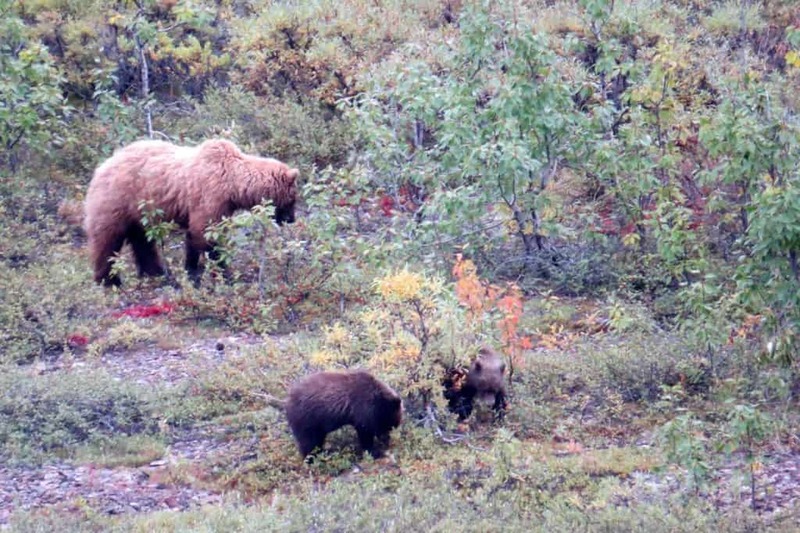 On the following day, the same bear family entered a campground, looking for food. So, now they were trying hard to scare the bears away from humans. 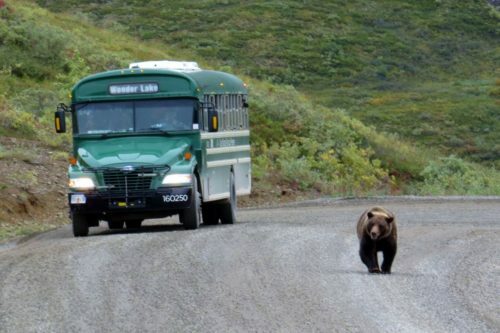 Chavez was very pleased to see that the bears did not come too close to the bus this time. We were really lucky! We counted a total of 19 bears during our Denali visit which is a lot. The most impressive sighting was of a large male who crossed the road and then kept walking along it, right next to our bus! Talk about a “Wow!” moment. And we had to stay very quiet, not to alarm the bear or alert him to our presence in any way. After we drove on, we could still see the bear on the road, even as another bus was coming up behind him. 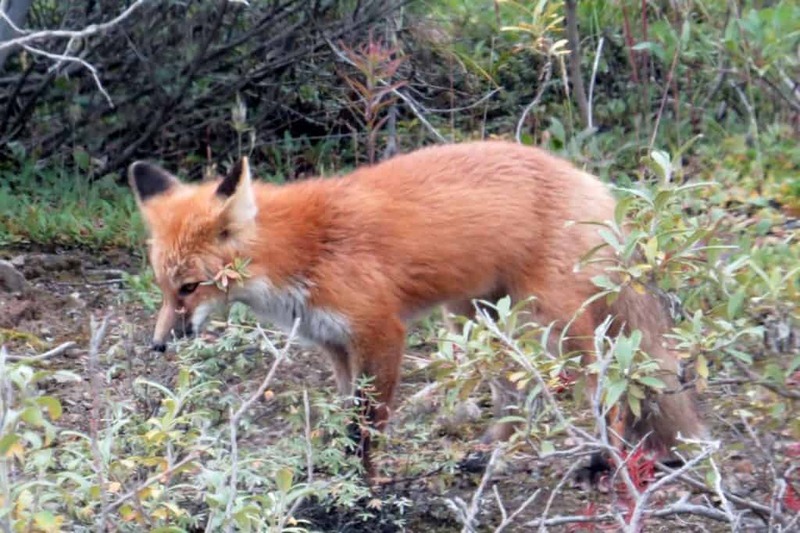 So, all and all, we were very pleased with the animal sightings on our drive through Denali National Park! We didn’t see The Mountain. Even when the sun was out where we were, Mt. Denali was shrouded in clouds. As it turns out, that’s the case for most park visitors and according to the statistics that I’ve read, only one third of them get to see the mountain in its entirety. 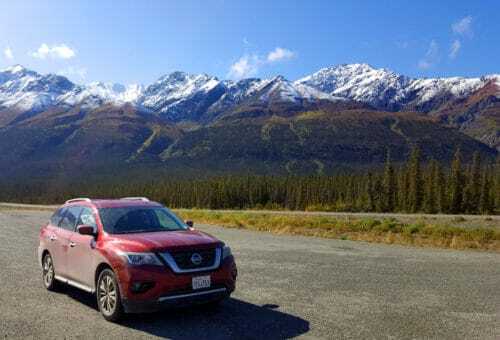 We did enjoy the majestic landscape that is Denali National Park. The shuttle bus has several stops en route, including a couple that are just for photo ops. 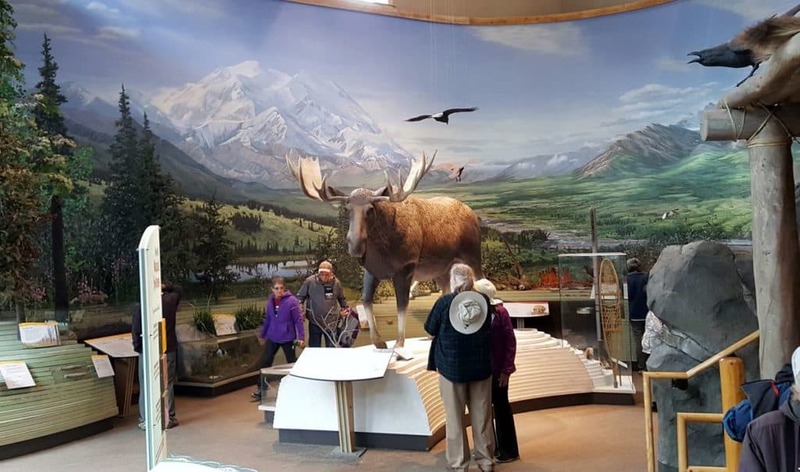 After driving for three and a half hours, we reached the Eielson Visitor Center at the heart of the park. That was the final stop for us. Chavez said that he will be turning back within half an hour and those who wanted to return with him were welcome. The rest could hang around for as long as they wanted to, hike around the visitors center and catch one of the other shuttles back. We decided to head back. We had had an early start to our day and felt like the additional 4 hours to get back would be enough for us. On the way back, the shuttle was only half full so we could each take a window seat and enjoy more narration from Chavez, as well as just friendly chat in an informal atmosphere. About a third of the wildlife viewing happened on the way back. We returned for another night at the Aurora Denali Lodge and continued on our journey the following day. 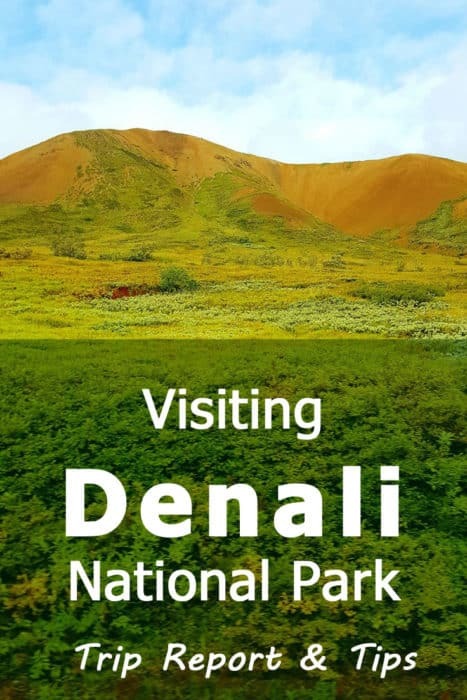 So, now that you know what we did in Denali and saw the photos, here are my tips for a successful visit to Denali. 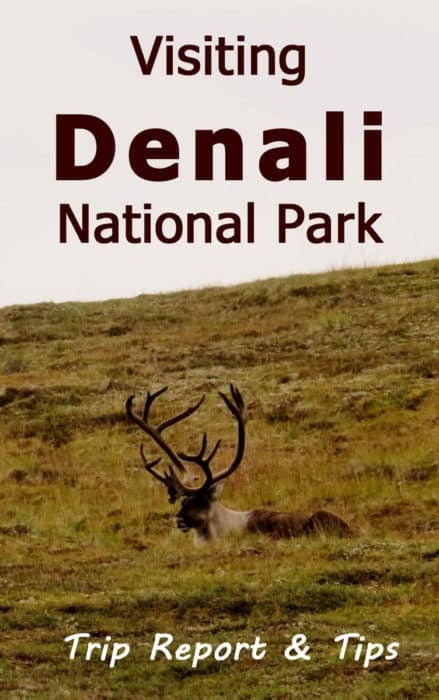 Denali National Park attracts visitors from across the globe. Almost all of them arrive between June and September. Which means the park is very busy during that time of year. Everything is in high demand and expensive too. What’s more, you can’t just drive your car into the park, like you would in Yosemite or Yellowstone. Nope, in Denali you’re only allowed to drive the first 15 miles of the road that goes into the park. To see the views from the other 87 miles of road, you’ll have to take a shuttle or a tour bus. Which one? More on that later on but for now I just wanted to mention that you really want to reserve your ride in advance. Accommodations? Oh boy, you better plan ahead. Denali National Park was by far the most expensive place that we stayed at during our Alaska trip. We paid $180 a night and that wasn’t even by the park gates but in Healy, a small town some twenty miles away from the park itself. If you’re looking for a decent family room closer to the park, be prepared to pay $400 a night or more. Even if you stay in the more decently priced Healy, it’s always a good idea to make your reservations well in advance. We stayed at the Aurora Denali Lodge and I’ll add a review of this lovely hotel in a separate post. Whatever you choose, the earlier you book, the better. Opt for a reservation with a cancellation option so that if you find a better deal, you can switch to that. 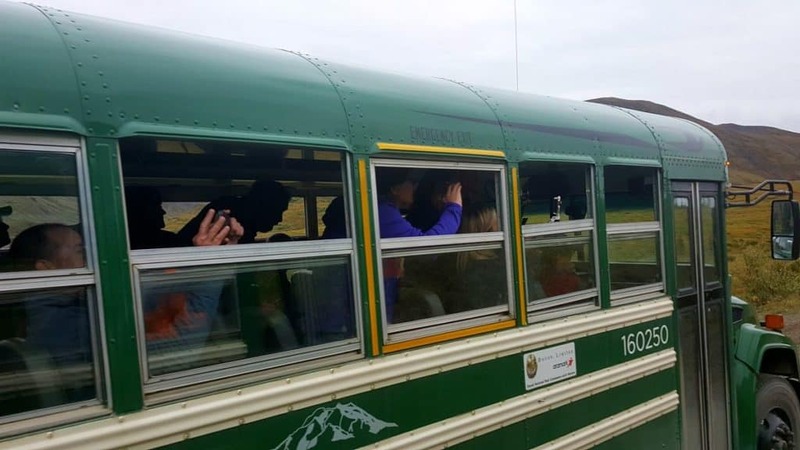 Known as “Narrated Bus” on the park website and as “The Denali Tour Experience” in the reservations site. 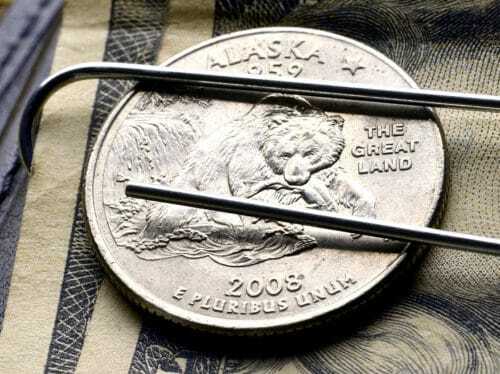 They are the more expensive option, costing $80-$194 depending on the length of the tour (discounts available for kids). 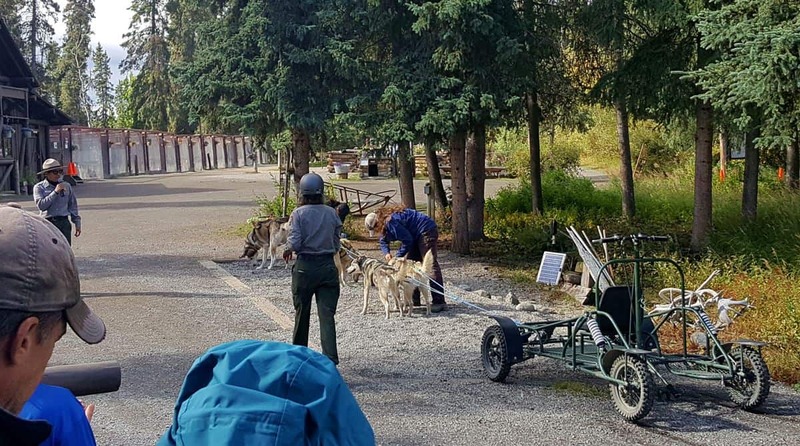 Some incorporate a talk by a park ranger or by an Alaskan native but their main selling point is that they guarantee a fully narrated tour by a driver who is also a naturalist. They are structured tours which means you stay with the group the entire time. The park website calls them the “non-narrated” bus and the reservation site calls them “shuttles”. They follow the exact same route as the narrated buses (there is no other road, after all) but offer a more flexible experience. Passengers may get on and off the shuttle at the various stops, catching a different one whenever they want. There is no guarantee of narration and the price is much friendlier, starting at $26.50 for the Tolkat River stop and going as high as $51 for Kantishna. Kids under 16 travel for free. Having read reviews by other travelers who mentioned the high quality narration that they got on the shuttle bus, it was really a no-brainer. As a family of four with two kids under 15, choosing the shuttle bus over the narrated bus meant saving hundreds of dollars. It was worth the risk of not having the best narration possible. Also, we liked the flexibility. And so here I am, adding my own testimony. We had a wonderful – and fully-narrated! – experience with the shuttle bus. 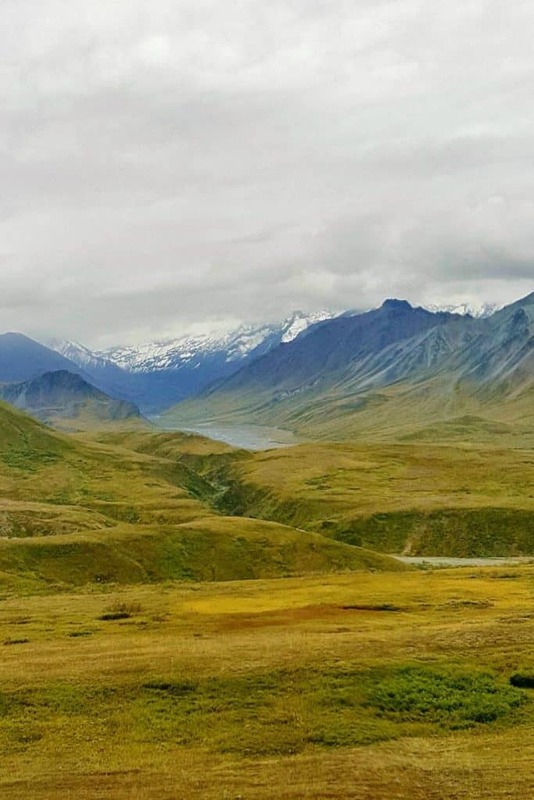 Our driver made sure we knew that he doesn’t have to narrate but also said he doesn’t mind doing that so that we make the most of our visit to Denali. And yes, we all tipped generously because he really did provide a top-notch experience which we appreciated. There are other buses going around the park. Three free shuttles take passengers from one point to another along the first 15 miles of the road. Insert Jedi voice: These aren’t the busses you’re looking for. To see the park in all its glory you have to take one of the paid options. There would have been plenty of time for us to pick up our tickets on the morning of the tour. However, I think it’s far less stressful to arrive the day before. There is a line at the counter and if you turn up late and you’ll be a rush to get your tickets. What’s more, arriving the day before gives you a full half day in the park. We used it to see the kennels and hike near the visitor’s center which was fun. It allowed for a leisurely visit and an early evening back in the lodge (which was a nice bonus since we had to get up very early the following morning). When you order the tickets for the shuttle or bus tour, they charge you an additional $10 per ticket as the entrance fee to the park. When we picked up the tickets, I asked if we could get a refund because we have the annual National Parks Pass. Indeed, we could! They cancelled the extra charge and refunded it to our credit card. If you don’t understand what I’m talking about then clearly you haven’t read other people’s recommendations about Denali. Try asking in the TripAdvisor forum and local experts will tell you that you should take the tour at least twice, preferably three or four times. Why? Because the more time you spend on the park road, the higher are your chances of viewing wildlife and seeing the mountain. Which is true, of course. Each time you travel into the park would be different, so the more trips you make, the more chance you have to see more types of animals and/or different behaviors. We got lucky with the wildlife but we didn’t see the mountain. Other travelers that we talked to didn’t see any bears. So why did we choose to take just one trip into the park? Traveling with kids, the thought of sitting for 8 hours in a bus was daunting. That’s the length of the drive to Eielson Visitors Center and back, with Eielson being the first stop on the road from where you can view his majesty, Mt. Denali. I wondered about taking a longer route but I just couldn’t see us sitting on our butts in a bus for 11.5 hours. When the day was over, none of us felt like repeating the experience the following day (I asked). Sure, it was fantastic but one day was enough. I did notice that we were the only family with kids. The other travelers were all adults, possibly with more patience. So, I’m not saying you shouldn’t take two trips into Denali National Park. I’m just saying we only took the one and were very pleased with our decision. The shuttles leave as early as 6AM. We made reservations for the 6:30AM shuttle because the earlier ones were fully booked by that time I made our reservations. (That was three months before the trip, mind! See Tip #1 about planning and making reservations in advance). It was still early enough for us to see plenty of animals. I’ve since talked about this to several travelers who visited Denali and never got to see bears, or only saw one or two at a distance. From everything that I’ve read and heard, this is mostly a question of timing. The animals are out foraging during the early morning hours and late evening. This is true of bear viewings in other areas, we’ve always had the most luck during dawn and dusk (and we have seen almost 100 bears by now). So, my advice is, make the effort and get there early. I know it’s not easy being up at 5AM when you’re on vacation but it’s just so worth it when you see a Grizzly walk up right next to your bus. We followed the rule of thumb – sit on the left on the way into the park and change sides on the way back. That way, you get the best views, to the south of the road. When it comes to animal watching, it doesn’t matter where you sit. Once someone spots an animal, the bus stops and passengers share the windows on the side of the sighting. There are several bathroom stops along the way. People leave their bags behind so everyone returns to the same seat. On the way back the shuttle was only half full so we could change our seats and get more window seats. This probably not the case for those returning later in the day. It’s not only that it can be cold out in Denali National Park, it’s also the fact that it can be both too warm and too cold inside the bus. When we headed out in the early morning, the driver turned up the heating and I undressed down to my teeshirt (and was very happy to be wearing one). Later, as people started opening windows to get a better view of wildlife, I put on a sweatshirt. Leaving the bus and going outside, a jacket was a welcome addition. And that was a on a nice day – I can imagine you’d need a rain jacket on some days. So, yes, don’t worry too much about the weather in August but do come prepared and dress in layers. There is no food available anywhere along the route so make sure you pack enough food and water for everyone. You can fill up your water bottles at the Eielson Visitors Center so carrying enough just for one way is fine. The views are stunning and the animal encounters thrilling so you want to be able to take good photos. Keep in mind that some of the animals will be very far away. Even if you follow all of the tips, and even if you take more than one trip into Denali, there are no guarantees. You may or may not see the mountain. You may see a dozen bears or none at all. This place is entirely wild and unpredictable. 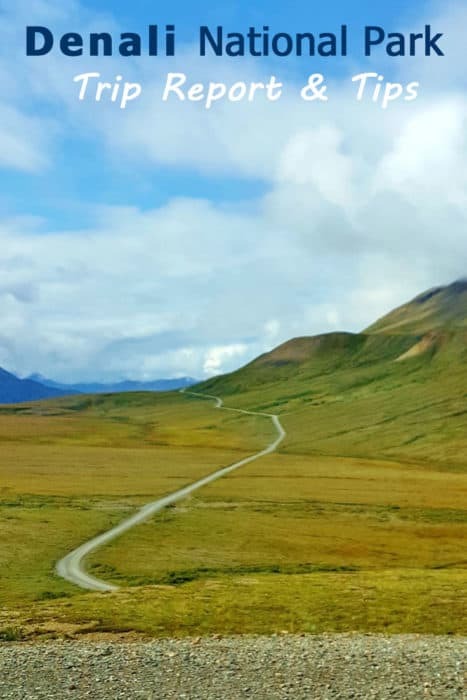 Pack some good luck along with you for good measure and be prepared to be thankful for whatever Denali National Park shares with you on the day of your trip. Just being out there, in the vast open space is incredible. 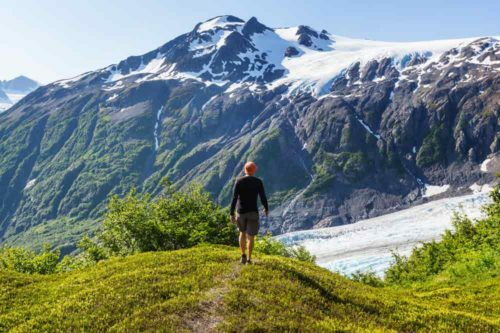 Looking to see more of that famous Alaska wild scenery? Check out my mega post about the National Parks of Alaska. 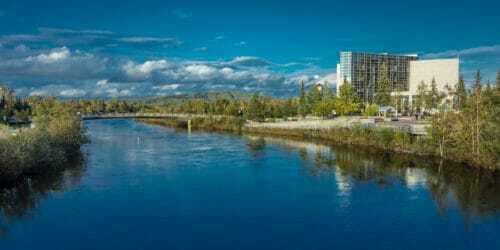 Or try my posts about things to do in Fairbanks and things to do in Anchorage for other kinds of adventures. Hi, Anne, I enjoyed reading your post about yur trip to Denali. 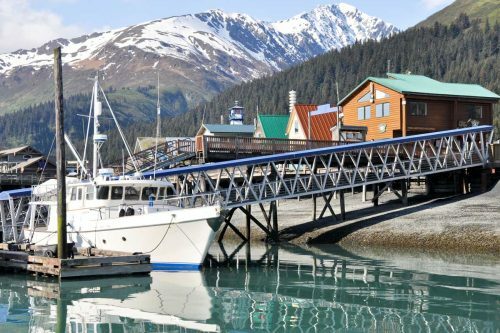 We have a cruise planned in Sept., arriving in ANC on 9/7, renting a car and driving to Denali on the 8th, then returning on the 10th to catch a train/bus to Whittier on the 1th. Your article was very helpful because it sounds like the amount of time we have in Denali with plans like yours. 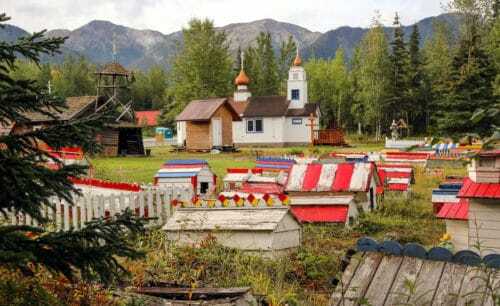 I had just finished reading about the Dog Sled training camp on another post, and I like the idea of going there the first afternoon. We, too, are staying at the Aurora Denali Lodge, I would love to see your review on it. The staff up there have all been very nice on the phone and sent me a few tips about the area. I also like the tip about asking for a refund for the Park Entrance. My husband has a senior National Park card, so I wondered about that. I love the tip about the green shuttle bus, too. I would like to go the entire route, but doubt my husband would like the 11-hour ride either. I plan on checking out your posts about what to see in ANC. Thanks again. I’m so glad you found this post helpful! 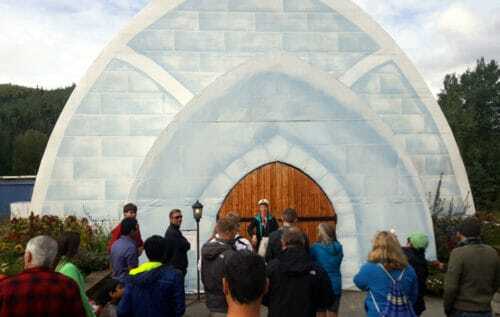 We had a good experience at the Aurora Denali Lodge and I hope you will as well. The room was spacious and clean and they had a nice breakfast. No complaints. Enjoy your visit! Thanks so much for the reply, Anne. I’m looking forward to the whole visit. Personally, I like quaint motels over the major chains. Do you have a recommendation for a stay in ANC that is inexpensive and clean? Hi. I enjoyed reading about your trip into the park. Do you know if there is a 1 day train tour? I keep seeing 3 days mentioned, but I don’t think we will have time for that this summer. We are looking to do a cruise ( never been on a cruise ship) and do some land and sea adventures. Any help would be much apprreciated. We have 5- 7 days available. I think you mean a train tour from Anchorage and back? I can see how that would be a three-day excursion. You’d need to spend some time to get from Anchorage to the park and some time getting back. In between you want to have at least one full day to explore the park. I don’t think it makes a good day trip from Anchorage, to be honest. If you have 5-7 days available once in Anchorage, I would look into renting a car and then traveling to Denali as well as to Seward. 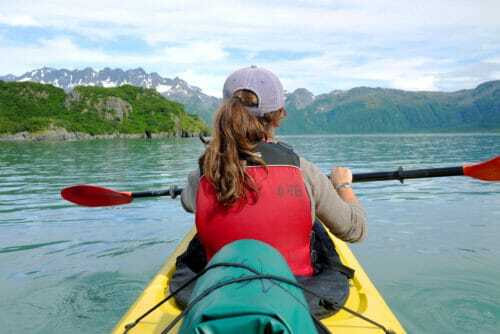 Here’s my post about things to do in Seward, AK. I hope this helps! Yes! We managed to see the Northern Lights in the first week of September! However, that wasn’t in Denali but in the Yukon, on our way back from Alaska to the Lower 48. I actually wrote a post about that very recently: What’s the Best Time to Travel to Alaska to See the Northern Lights? I shared our own experience in that post. Enjoy your visit to Denali! I’m sure it’s going to be awesome with or without seeing the lights! Your Denali visit sounds perfect. I am planning a trip for my sister and her husband for next year for their anniversary of two weeks in Alaska, Denali of course being on the agenda. Can you tell me why you started in Fairbanks. I have started a trip in Anchorage and departed from Fairbanks in the past, but not the other way, will need to consider that also. Was airfare the consideration? It is still too early to look at airfare but we are putting together a travel agenda on paper. I have taken the fully guided tour bus in Denali and knew nothing of the kennels so obviously did not do my research. We will definitely consider the shuttles. Thanks for a great report. 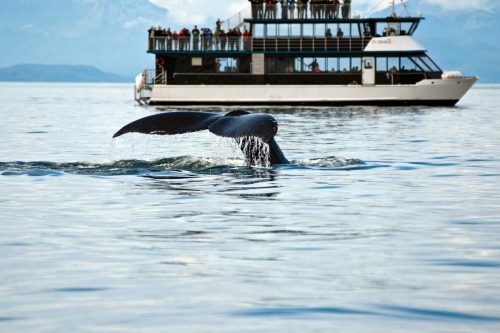 In our case, we drove all the way from Los Angeles and also included Seward and Valdez in our itinerary. The way we did it was – Whitehorse > Fairbanks > Denali > Anchorage > Seward > Valdez > Whitehorse. We could have switched directions but that would have meant doing Whitehorse > Valdez > Seward > Anchorage > Denali > Fairbanks > Whitehorse. Totally doable but I thought Fairbanks would be a bit of an anti-climax coming in the end. Also, coming in, we sort of wanted to have a bit of “city time” to start with. It ended up working very well for us. A long stop (four days) in Fairbanks was great after driving the Cassiar and parts of the Alaska Highway. A sort of “returning to civilization” feeling. Then heading out to wild Denali, Seward (Kenai Fjords) and Valdez. That’s with time to spare, so they can add days in places of interest. We found Alaska very easy to drive through. There was cell reception in most area – as good as anywhere else in the Western US – and the roads were good. I’m sure your sister and BIL are going to love Alaska – they’re very lucky to have you help them out with planning! Thank you for sharing. What month did you go there? We visited in August 2017. Glad you enjoyed the post! Sorry for taking so long to reply. It’s been a hectic week here! I agree with you that with 3 days dedicated to the Denali excursion, they’re probably counting one day of getting to the park and one for returning, so probably just one full day in Denali. Sounds like they already booked you on either a shuttle or an actual tour bus. I don’t think you could fit in an additional tour. However, you may prefer to take that day to tour Denali in a separate shuttle tour to go further into the park. 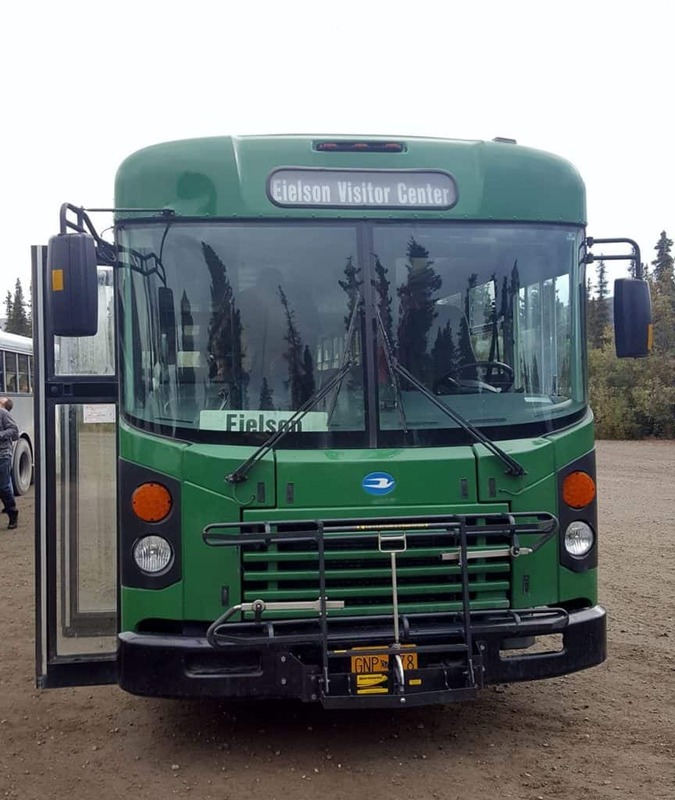 A 7 hour tour means they’re taking you only as far as the Eielson Visitor Center. You can book your own shuttle tickets for the same day, leave your group and take the longer drive into the park instead. I’m not saying that I recommend doing that, only that it’s probably an option. Personally, I found the 7-8 hour tour to Eielson and back enough but many recommend taking the longer tour. Having said all that, if you plan on making changes, definitely check with Holland America first. You don’t want to book anything that will end up conflicting with your overall plans to get back to your cruise. As for food, there is no food available inside the park itself once you’re on board the bus/shuttle. It’ll have to be sandwiches and snacks that you bring with you. You can get those in the facilities in the park entrance (before boarding the shuttle/bus) or anywhere near where your accommodation will be. 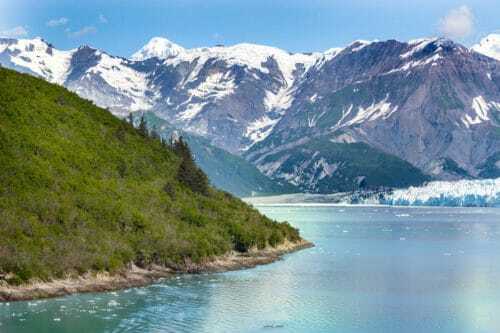 Check with Holland America and try to find out which hotel they booked for your Denali visit, then you can check for grocery stores and/or cafes/restaurants around that. I am visiting Denali in 6 weeks time and I have been doing lots of reading up in the meantime. So excited. Loved your post and I have sent the link to my partner so he can read it too. Will be camping in an RV within the park at one of their dedicated RV camp sites. Sounds amazing! I hope we can do that too someday! 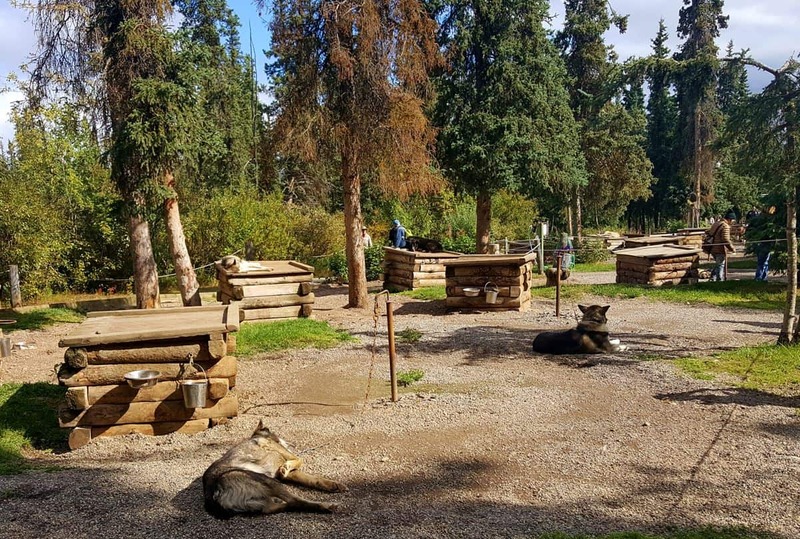 If you feel like writing a guest post here about your Denali camping trip, that would be super awesome! Enjoy!